Alex Faickney Osborn defined precise tenets when he developed the brainstorming technique (Applied Imagination, 1953). Although the main principles were set decades ago, they are still very effective. There is no point in diverging too much. Withholding Criticism — When you start brainstorming, you should step away from your inner critic. Do not try to think about the ideas you get, and do not ditch a single one of them, even if it seems irrelevant. Just focus on adding more ideas on the list, and save the criticism for later. Focusing on Quantity — Brainstorming is one of the rare methods that focus on quantity instead of quality. This is the rule that Osborn established: maximum quantity breeds quality. You need to generate a great number of ideas, and then reduce them to an outstanding solution! Combining and Improving Ideas — There is hardly an idea that’s entirely unique. However, when you combine different ideas, you can come up with a fresh concept. You need to encourage the process of association once you get a decent list of ideas. Encouraging Unusual Ideas —Stimulate your mind to come up with unexpected ideas. Try to approach the topic from an unusual angle and make some assumptions. Creativity is all about discovering new ways of thinking; the technique of brainstorming should support that process. Tom Kelley is another expert on innovation who made immense contributions to the concept of brainstorming. If you want to master this technique, then you should definitely read his book The Art of Innovation. You don’t have enough time to read an entire book? Then you’ll surely appreciate the following brainstorming guidelines inspired by Kelley’s approach. 1. Stand Up! When you are relaxed in a comfortable sitting position, your mind is focused on the task at hand. That’s not what you need at this point. You want to be more energetic, faster, and engaged in creative thinking. Stand up or even walk around the room. You’ll immediately stimulate your thoughts to flow faster. 2. You Need Space! Your mind’s patterns are a reflection of your mood. If the work space is suffocating, your ideas will be narrow as well. Try brainstorming outside or in a big, clean room. You’ll immediately notice the difference. 3. Be Crazy! Creativity never complies with the rules of mediocrity. Challenge yourself and the team members to get out of the box! 4. Plan! 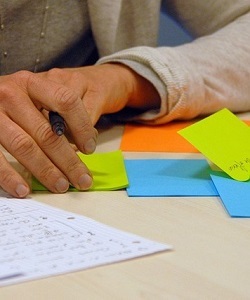 A brainstorming session usually takes 70-75 minutes. Use the first 10-15 minutes to start a relaxed discussion, explain the topic and issues to the participants and get them into thinking mode. Then, use the following hour for some real brainstorming. 5. Communicate with the Right People! You need to select your team very, very carefully. Not everyone can make great contributions to the brainstorming process. Some people will just slow you down, while others will get on your nerves. The members of the brainstorming team won’t be in charge for the final decisions, so you should specifically instruct them to focus on the initial stages of generating ideas. Don’t hesitate to collaborate with people you don’t know. As long as they are have the needed knowledge and experience, they will give you a different perspective on the matter. 6. Adjust the Size of the Team. Jeff Bezos, a successful entrepreneur and investor, has a great rule you can follow: If you can’t feed a team with two pizzas, then it’s too big! 7. Warm Up! You can’t get into ‘brainstorming mode’ whenever you decide to. Unfortunately, your mind doesn’t have a switch. Here is one way of warming up: Find a long word in the dictionary, and try to think of as many words as possible with the same letters. Give yourself five minutes, and you’ll gradually increase your brain’s activity. 8. Do Not Judge And Criticize! It doesn’t matter whether you’re brainstorming alone or in a team; you need to embrace the possibilities and take all ideas into consideration! 9. Stick to the ‘Third Third’ Principle! Once you get enough ideas, you need to start the selection process. According to the ‘third third’ principle, the first third of your ideas will be the most obvious picks. When you analyze the list, you’ll notice that you started thinking more creatively when you were coming up with the second third of ideas, but the third third contains the most unusual and unexpected thoughts. 10. Take Notes! Make sure to supply the team with pens, sticky notes, smartphone apps and other necessary tools that enable them to capture all ideas. 11. Finish on a High Note. The brainstorming process doesn’t end with a single session. You need to inspire yourself and everyone else to seek even more creative solutions. There is no need to complicate a process that should remain simple and effective. When you follow the basic principles of brainstorming, you’ll realize that you don’t need different apps and tools to inspire yourself to get more ideas. All you need is a positive attitude! Antonio is a hopeless optimist who enjoys basking in the world's brightest colors. He loves biking to distant places and occasionally he gets lost. When not doing that he's writing for EduGeeksClub.